Barack Obama was two years old when Martin Luther King -- standing in front of the Lincoln Memorial -- declared, "I have a dream that my four little children will one day live in a nation where they will not be judged by the color of their skin but by the content of their character." Mr. Obama's generation is the generation on which Dr. King's hopes were riding. It is not too much of a stretch to conclude that -- even after "the searing injustice" in the aftermath of Hurricane Katrina -- King, upon hearing Obama's speech in Philadelphia, would have nodded in agreement: "I believe deeply that we cannot solve the challenges of our time unless we solve them together -- unless we perfect our union by understanding that we may have different stories, but we have common hopes; that we may not look the same and we may not have come from the same place, but we all have to move in the same direction -- towards a better future for our children and our grandchildren." But Obama did more than reaffirm King's core conviction. He was more than a spokesman for his race. He illustrated what I have returned to more than once in this space: he showed that he has the ability to get inside the skins of people on both sides of the racial divide and truly understand their grievances. Speaking of his pastor's racial intolerance, he reminded his audience that Jeremiah Wright grew up in an era when "legalized discrimination -- where blacks were prevented, often through violence, from owning property, or loans were not granted to African-American business owners, or black homeowners could not access FHA mortgages, or blacks were excluded from unions, or the police force or the fire departments -- meant that black families could not amass any meaningful wealth to bequeath to future generations." In that context, said Obama, Mr. Wright's anger and intemperance were understandable, if not condonable. But then Obama turned his attention to white families whom affirmative action policies have disadvantaged. "Most working and middle class white Americans," he declared, "don't feel that they have been particularly privileged by their race. Their experience is the immigrant experience -- as far as they 're concerned no one's handed them anything, they've built it from scratch. They've worked hard all their lives, many times only to see their jobs shipped overseas or their pensions dumped after a lifetime of labor. They are anxious about their futures and feel their dreams slipping away . . . ."
In that context, said Obama, "when they are told to bus their children to a school across town; when they hear that an African American is getting an advantage in landing a good job or a spot in a good college because of an injustice that they themselves never committed; when they're told that their fears about crime in urban neighborhoods are somehow prejudiced, resentment builds over time." No one, to my knowledge, has ever tackled the problem of race in America from the perspective of Mr. Obama. His opponents have tried to make his lack of experience his Achilles' heal. The question is, "Which experience, and how critical is it?" It would appear that Mr. Obama's experience has been particularly unique and -- I suggest -- absolutely critical. Whatever he and his countrymen have been asked to face, they have always been citizens of a nation divided -- fundamentally divided by slavery and its legacy. If the United States is to survive the brave new world of global terrorism -- which, at root, is the result of the same kind of cultural schism which led to a Civil War and segregation -- it will have to heal itself. Martin Luther King knew that. That's what King saw from "the mountain top." He knew that, like Moses, he would not make it to the promised land. But he hoped that his children would. Mr. Obama's run for the presidency is a sign that Dr. King's children have arrived. 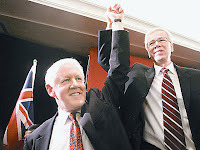 When I began this venture a year and a half ago, I suggested in one of my first posts that the Liberal Party should choose Bob Rae as its next leader. Obviously, they did not heed my counsel. But, like a lot of Canadians, I was willing to give Stephane Dion a chance to re-create the Liberals. His efforts to date have not been impressive. However, Mr. Rae's arrival on the Opposition front benches may give the party the real world and rhetorical skills Dion lacks -- not to mention a sense of genuine wit. Rae is not without his faults. As a teacher in Ontario during his time in power, I worked my share of "Rae Days" without pay. And, for that, Rae was despised by a majority of Ontarians. I never felt that way about the man -- although I should confess that I didn't vote for him. Nor did I vote for the man who succeeded him. But I was taken with Rae's idea that it was better to lose pay than a job. And, while the central premise of his approach to the recession of the early nineties was to share the pain, it was not a popular message. Voters want politicians to relieve their pain, not spread it around. Unfortunately, while Rae himself was one of the most gifted politicians of his generation, his cabinet lacked depth. They simply did not inspire public confidence. The combination of an unpopular message and a weak cabinet doomed Rae. He is still one of this country's most able politicians. The difference this time is that he adds considerable strength to the Liberal bench. Rae will be a target for the Conservatives. Jim Flaherty, the Minister of Finance -- and Ontario's former finance minister -- will remind the public that Rae's tenure coincided with hard times. But Rae did not instigate those times. And, sticking to the playbook he used when he was in charge of this province's finances, Flaherty has chided premier Dalton McGuinty for not cutting taxes on business. He will fulminate, claiming the federal Liberals are as incompetent as their provincial cousins. But he conveniently ignores the fact that the downturn in the United States has dried up demand for Ontario products -- particularly automobiles. Cutting taxes will increase the supply of goods. But, if the public cannot afford to buy what you make, all you will do is stock your warehouses and fill your parking lots. Mr. Flaherty's panacea comes at a time when the whole supply side experiment has proved to be, literally, bankrupt. E. J. Dionne, in The Washington Post last week, offered an accurate evaluation of the economic policies of the last thirty years: "Never do I want to hear again from my conservative friends," he wrote, "about how brilliant capitalists are, and how much they deserve their seven figure-salaries and how government should keep its hands off the private economy." For now that it has all blown up in their faces, "they are desperate to be bailed out by government from their own incompetence and from the deregulatory regime for which they lobbied so hard." Mr. Rae will be quite prepared to make that argument; and, when Mr. Flaherty pushes back, Rae will remind Canadians that the man who railed against debt left Ontarians a five and a half billion dollar deficit. Mr. Flaherty's stewardship of the economy was no brief, shining moment. And, as a lawyer, he will be remembered for his proposal to deal with the homeless by sweeping them off the streets and housing them in jail for the night. I used to work for a man who was fond of saying that "stupidity is its own curse." I have no idea who will win the next election -- it is too soon to tell. But I suspect that, when it comes to stupidity, Mr Rae will draw public attention to it, eloquently and in two languages. It seemed that every time I sat down to watch the news this week, a picture of former New York governor Eliot Spitzer appeared on the screen. The fall of Spitzer reads like a Greek tragedy. But there is a bigger tragedy unfolding -- and it has been unfolding for sometime now. Despite the media's fixation on Spitzer, what riveted my attention this week was another series of images, broadcast during the BBC's nightly newscast. In Ontario, California -- not far from Los Angeles -- a tent city has sprung up. "Over the last six months," reported The Los Angeles Times, on February 3rd, "more than 250 homeless people have pitched tents near the Ontario airport, creating a burgeoning shantytown that sprawls across vacant lots and spills into side streets." 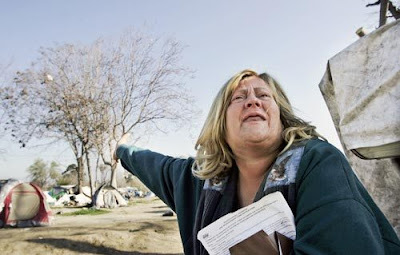 The story continues, "Pregnant women, parolees, alcoholics, the mentally ill, people fallen on hard times: They're all here living on donated food and water." The scene has been repeated in cities throughout North America for over a generation, to the shame of both Canada and the United States. But, according to the BBC, a new wrinkle has been added to the story. Since the report in The Times, the number of residents in this refugee camp has swollen, because many of the newcomers have lost their homes to the foreclosure crisis which is sweeping the United States. If a home owner loses his or her job, if a relative requires expensive medical care, or if the new monthly payments are out of reach when their mortgages reset, thousands of people are finding themselves in the same position as those in California. It is a scene out of Steinbeck"s The Grapes of Wrath. While the homeless were taking refuge in tent cities, dismissed investment bankers were testifying before the American Congress. Stanley O'Neil, who used to run Merrill Lynch, walked away with a severance package worth $161 million, even though the organization, under his stewardship, lost $10 billion; Charles Prince of Citigroup walked away with $61 million after staggering losses at his bank; and Angelo Mozelli reportedly pocketed some $115 million, after his nearly bankrupt company, Countrywide Financial, was gobbled up by Bank of America. Angry shareholders, however, forced him to give back $37.5 million of that. According to salary surveys in the United States, between 1996 and 2006 CEO pay went up 45%, while the pay of the average worker went up 7%. And therein lies the problem. Economic policies of the last generation have led to an unconscionable concentration of wealth in the hands of a few. As Robert Reich (Bill Clinton's former Secretary of Labour) wrote this week,"We're reaping the whirlwind of many years during which Americans have spent beyond their means and most of the benefits of an expanding economy have gone to a relatively small group at the very top." The story is the same in Canada. As Tom Walkom reported a year ago in The Toronto Star (see my post of March 7, 2007) "the richest 20% of Canadians own 75% of the nation's wealth" and "we allow the country's 100 chief executive officers to make, on average, 240 times more than the typical worker, up from 106 times the average wage in 1998.)" All this is the consequence of supply side economic policy. The fallacy of that policy, says Reich, is the belief that if you juice the supply side of the economic seesaw, you will (as if by magic) stimulate demand. The problem, however, is that -- because of the concentration of wealth at the top -- there is no money at the bottom to demand anything. And, until recently, the money available was borrowed money. Now even the borrowed money has dried up. To put this situation in perspective, Reich quoted Merriner S. Eccles, who was Franklin Roosevelt's Chairman of the Federal Reserve: "As mass production has to be accompanied by mass consumption, mass consumption in turn implies a distribution of wealth -- not of existing wealth, but of wealth as it is currently produced -- to provide men with buying power equal to the amount of goods and services offered by the nation's economic machinery. Instead of achieving that kind of distribution, a giant suction pump had, by 1929-30, drawn into a few hands an increasing proportion of currently produced wealth." It is too soon to know whether history will repeat itself. But the parallels are obvious -- and the burgeoning tent city in California underscores them. I have previously quoted George Santayana in this space: "Those who refuse to learn from history are doomed to repeat it." John Kenneth Galbraith chronicled the political folly which spawned the Great Depression in his book, The Great Crash, 1929. The root of the problem, Galbraith wrote, was the inability of policy makers to recognize that "Money differs from an automobile or a mistress in being equally important to those who have it and those who do not." In their inability to recognize that fact, the policy makers of the 1920's share one characteristic with the policy makers of the last twenty-five years: they had and have (as Galbraith also noted) an extraordinary capacity for self-delusion. Stephen Harper found himself fighting battles on several fronts this week. First, there was the controversy surrounding the insurance policy which two senior Conservative operatives allegedly offered independent MP Chuck Cadman shortly before he died in 2005. Harper maintains that Cadman was offered "financial considerations" to help him pay election expenses, if Cadman's vote to defeat Paul Martin's Liberals forced Cadman to run in the next election. But whether Cadman was offered an insurance policy or money to pay election expenses is immaterial. The whole story doesn't pass the smell test. 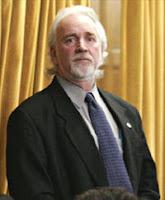 Cadman had been evicted from the Alliance Party, the original vehicle which Harper rode to the leadership of the new Conservative Party of Canada; and the new party had already chosen its candidate to run against Cadman. Why would the Conservatives offer financial support to their rival? The implication is that Harper, or envoys acting as his agents, were trying to buy Cadman's vote. When the Liberals had the gall to level that charge, the Prime Minister vowed that he would see them in court. Then there was the leak of a memo from the Canadian consulate in Chicago, claiming that, while Barack Obama was threatening to reopen NAFTA, he really wasn't serious about it. The memo led to charges that Canada was interfering in the American Democratic primary. When ABC News released the story that Obama's apparent duplicity on NAFTA originated with Ian Brodie, Harper's Chief of Staff, Harper denied the claim -- until it was verified. Now, he says, he will investigate everyone connected to the leak. As James Travers noted in the Toronto Star, discretion is the soul of diplomacy; and, while the Harper government is not the first to throw discretion to the winds, the whole affair suggests diplomacy is not this government's strong suit. And, two nights ago, Dan McTeague's private member's bill (which offered parents an annual $5000 tax break for each of their children who eventually attended institutions of higher learning) passed the house. The cost of the program was estimated at one billion dollars a year. Claiming that the government didn't have "money to throw around" the Conservatives vowed to kill the bill in the Senate -- a body they want to abolish. Having decreased the government's revenue stream by $10 to $12 billion a year after cutting the GST 2 percent, Mr Harper and his associates claim that the cupboard is bare. They know how to cut costs. But this government, led by a professional economist, doesn't know how to invest in the country's future. More and more, these folks are beginning to look like The Gang That Couldn't Shoot Straight. Despite their sound and fury, their wounds are self inflicted. A recent Canwest Global poll suggested that one in three Canadians believes Harper is lying when he claims that he knew nothing specific about the offer made to Cadman. Mr. Harper is someone who insists that everything the government does be routed through his office. It's hard to believe that he was unaware of what was going on behind the scenes with any of these files. However, knowledge and judgment are two different things. One does not necessarily proceed from the other. And trying to mask that fact with half truths merely calls attention to one's shortcomings. The last Conservative Prime Minister of Canada developed a reputation for embroidering the truth. That reputation haunts Brian Mulroney to this day. As Lawrence Martin wrote this week in The Globe and Mail, "it's hard to give the government the benefit of the doubt. . . its credibility is suspect." Like Samson in Milton's poem, Mr. Harper could bring the whole edifice down around his ears. The man who several of his fellow pundits dubbed "The Father of Modern Conservatism" died last week. I first encountered William F. Buckley as a television commentator during the 1968 Democratic convention. Still an undergraduate, I was not far removed from my first encounter with J.D. Salinger's Catcher in the Rye; and Buckley, with his New York Brahmin dialect and polysyllabic vocabulary, struck me as a flesh and blood example of what the fictional Holden Caulfield called a "phony." When I began to read Buckley's opinions, which he produced prolifically, I was horrified. His support for the late Senator McCarthy, the late General Franco and -- most importantly -- the late Jim Crow, struck me as instances of what Orwell called "the defense of the indefensible." Siding with Southern segregationists after the Brown vs. Board of Education decision in 1954, Buckley wrote, "The central question that emerges. . . is whether the White community in the South is entitled to take such measures as are necessary to prevail, politically and culturally, in areas in which it does not predominate numerically. The sobering answer is Yes -- the White community is so entitled because, for the time being, it is the advanced race." Even though Buckley spoke in the same cadences as Franklin Roosevelt and he flashed the same winning smile, he spoke for what Roosevelt called the "economic royalists." In fact, in the pages of National Review, Buckley declared war on the New Deal; and he considered Republican presidents like Dwight Eisenhower, who had come to terms with Roosevelt's legacy -- leaving in place its tax structure and building the interstate highway system -- traitors to the cause. But as an old university debater, I found myself tuning into the many debates Buckley held on his long running PBS program, Firing Line. What struck me most was the people Buckley invited to support the opposing side. Noam Chomsky, John Kenneth Galbraith and Senator Gary Hart regularly crossed swords Buckley; and the quality of debate was stellar. It wasn't long before I read that Buckley and Galbraith -- the fervent anti-New Dealer and the passionate New Dealer -- were good friends. Clearly, Buckley did not let politics get in the way of friendship. He could get inside the heads of his opponents and see the world from their perspective -- or, as Robert B. Semple wrote last week in the New York Times, "He hated most of what the liberals stood for. He didn't hate them." Unfortunately, even though he could get inside his opponents' heads, he never learned the trick which Atticus Finch, in To Kill a Mockingbird, suggested that his daughter Scout learn: to get inside someone's skin and walk around in it. One suspects that Buckley found that trick simply unseemly. If Buckley had truly understood what "separate but equal" meant for someone whose skin was black, he never would have thrown in his lot with Strom Thurmond and George Wallace. He did manage to get inside Ronald Reagan's skin, though; and Reagan's victory represented the triumph of Modern Conservatism. Reagan, the economist Milton Friedman, and Buckley were the most important spokesmen for that program. And we, in North America, have been living with the consequences of their success for nearly thirty years. The last eight years have seen the fracturing of the coalition of national security conservatives, social conservatives and religious conservatives which Buckley helped build. He has watched the neoconservatives under George W. Bush destroy that coalition and bastardize the ideas for which he stood. Of Bush's invasion of Iraq, Buckley wrote "One can't doubt that the American objective in Iraq has failed;" and he suggested that Bush administration policy going forward should be based on "acknowledgement of defeat." 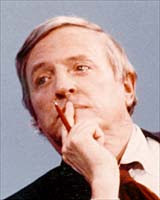 The Iraq War was, said Buckley, "anything but conservative." Buckley's recognition of the disaster in Iraq was proof that he could change his mind. He told Michael Kinsley some years after his editorial declaring that southern whites were "the advanced race" that he had misunderstood the civil rights movement; and, having initially supported Richard Nixon for president, he eventually called for Nixon's resignation. Unlike the present occupant of the White House, Buckley could admit his own fallibility. I found little to admire about Buckley's politics. But his insistence that politics was about ideas -- and that it was also about incisive and civil discussion -- should live long after his passing. Unfortunately, many of his successors on the right, like Ann Coulter and Rush Limbaugh, seemed to have missed that lesson. One can hope that it is a lesson which will not be lost on the next generation.